The Kentucky Derby 2014 is almost upon us so let the partying begin! From the Barnstable Brown Gala to the less informal Kentucky Derby Festival, residents of Louisville, Kentucky will have plenty to celebrate this weekend dubbed Kentucky Derby weekend. Most people do not realize that the Kentucky Derby is much more than just a 2 minute horse race. The city of Louisville plans events that led up to the Run for the Roses that engages the community and builds up excitement for the Kentucky Derby. 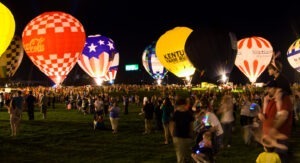 Did you know that there is a marathon, a lineup of concerts, a parade and the world’s largest fireworks show called Thunder over Louisville that helps kick off the Kentucky Derby? The Kentucky Derby Festival is a lead up to the big race. What better way to introduce the world to the Derby than 3 weeks of festivities leading up to the Derby. While some people see the Kentucky Derby as a betting event with massive payoffs, the Kentucky Derby should be viewed as more of a cultural event than anything. If you research Kentucky Derby history, you will see that the cultural ties to the Derby are like none other found in any other sporting event. While some see the Kentucky Derby as just another high profile horse race, the Kentucky Derby is much more than that. The Kentucky Derby combines southern hospitality, fashion, bourbon and gambling. The Kentucky Derby is truly a unique experience which is kicked off by the Kentucky Derby Festival.